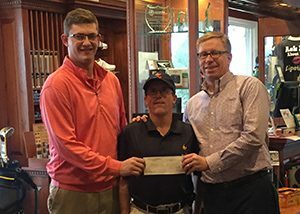 Bardstown Country Club Assistant Pro Zach Graves and Special Olympics golfer and Bardstown CC employee Eric Duncanson present a check for nearly $900 to Special Olympics Kentucky. Bardstown Country Club Assistant Pro Zach Graves presented a check to Special Olympics Kentucky for nearly $900 on Tuesday, Dec. 5. The donation was the result of his efforts on Kentucky PGA Golf Day on Oct. 2. Kentucky PGA Golf Day is an opportunity for PGA Members throughout the state to raise money for the Kentucky Golf Foundation and other local charities. Graves chose a 100 holes fundraiser, where he plays 100 holes of golf at Bardstown Country Club in one day and asked for per hole donations. Graves didn’t have to look far for the inspiration to choose Special Olympics. He works nearly every day with 2014 Special Olympics USA Games silver medalist Eric Duncanson at the course. In all, Graves raised $2,025, with some of it going to the Kentucky Golf Foundation and the almost $900 going to Special Olympics Kentucky. You can get an idea of Zach’s day at the Facebook page he set up for the fundraiser. Eric Duncanson claimed the silver medal in his division at the 2014 USA Games in New Jersey. Graves plans on repeating the effort in October 2018. For information about the 100 Holes fundraiser or about how you can support his effort in 2018, contact him at zgraves@pga.com. This isn’t the first time that a member of the Bardstown Country Club staff has stepped up to support Special Olympics or Duncanson. 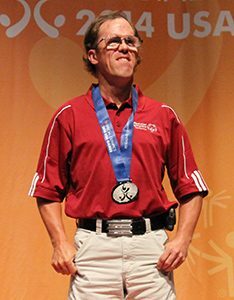 Club Pro Chris Osborne served as Duncanson’s caddy at the 2014 Special Olympics USA Games. The Kentucky PGA is a longtime supporter of Special Olympics Kentucky and the PGA is a strong supporter of Special Olympics nationally. Over the years the Kentucky PGA has served as a sponsor of the Special Olympics Kentucky golf program. The PGA has regularly included Special Olympics athletes at events and clinics surrounding the PGA Championship and the Ryder Cup and has served as a host and supporter of the Special Olympics North America Invitational Golf Tournament. Our thanks to Zach Graves and the Kentucky PGA for their support of our athletes.